Back to school banners are a great way to welcome faculty and students back for another school year. It's easy to get custom back to school banners from Banners.com! We have back to school banner templates already built for you to customize by adding text, photographs, clip art and backgrounds. To get started, go to our Back to School Banners page. The first step is to select the banner size and quantity from the drop down menus. Banners are finished with heat welded hems and grommets every 2-4 feet around the banner perimeter. You can also select to have pole pockets, reinforced hems and reinforced corners. If you are using your banners indoors, we do not recommend using reinforcements.The price will adjust when you select your options. 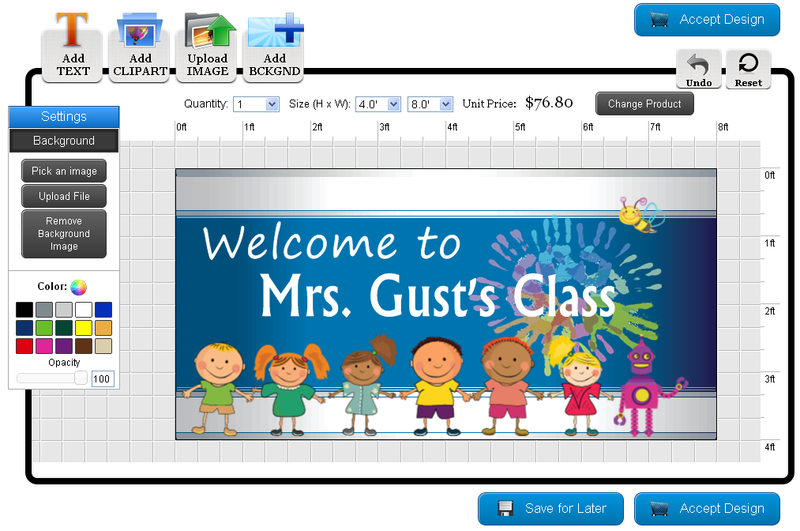 There are three different ways to order back to school banners: pick a template, upload a file or let us design. We will be discussing the "Pick a Template" method. 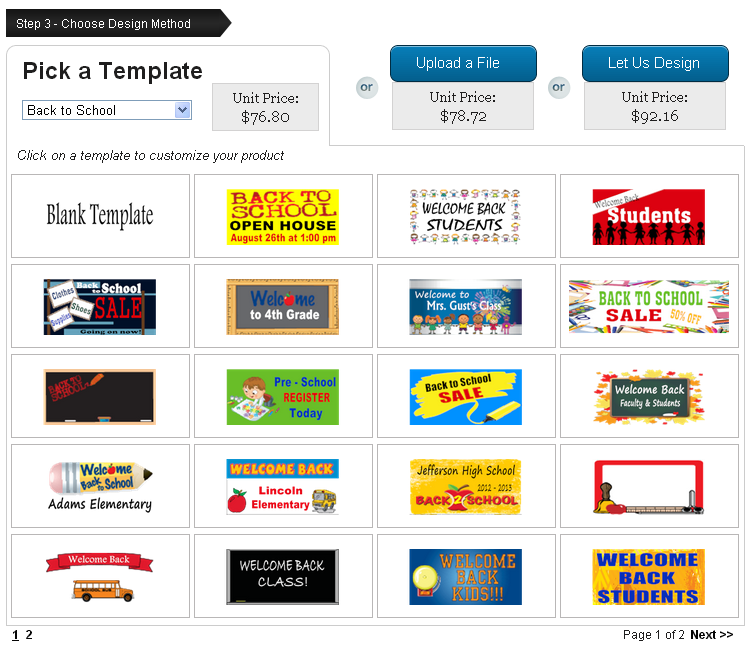 All of our templates are customizable. If you find a template you want to customize, put your mouse over the template and click on the "Customize Template" button. This will take you into the online designer. You can also select the "Blank Template" to start your design from scratch. Click on the "Add CLIPART" button. A popup window will appear. Select the "Educational" category. You will find lots of back to school clip art and other school clip art. Click on an image to add it to your design. 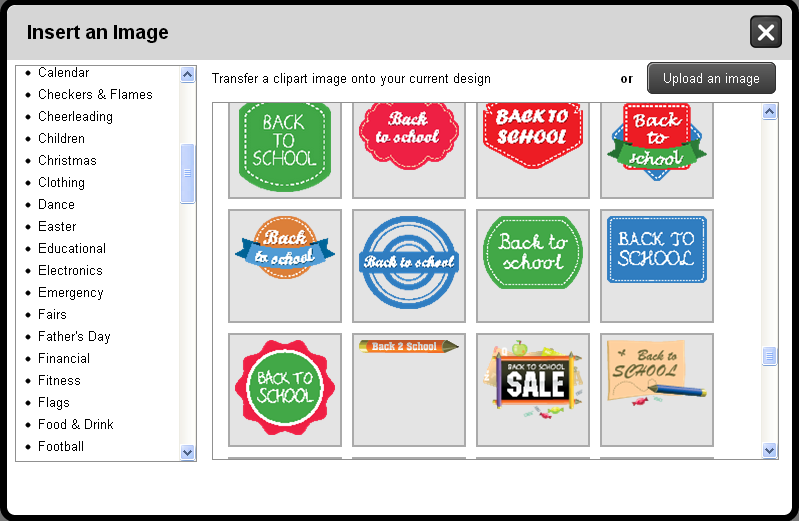 If you click on the clip art in the online designer a red outline will appear with 8 circle around the perimeter. You can re-size the clip art by selecting one of the 8 circles on the red line and moving your mouse. If you click "Ctrl" and drag the image it will keep its proportions. You can also move the image to the front or to the back by clicking on the up arrow or down arrow. The red circle will revert the clip art back to the original. The trash can will delete the image. Click on the "Add BCKGND" button. A popup will appear. Scroll down and click on the "School Backgrounds" category. 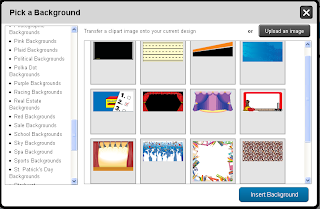 If you find a school background you like, click on the "Insert Background" button. Once you have finished your design and would like to begin the checkout process, click on the "Accept Design" button. Click here to get started on your back to school banner.